Upon entering this adorable authentic log cabin named Blueberry Hill, you are greeted with a spacious great room with gleaming wood floors, log walls,and dramatically high solid wood beamed cathedral ceiling! Enjoy watching TV or just getting cozy in front of the beautiful stone gas log fireplace. Relax in the outdoor hot tub before getting a good night's sleep in the quilt covered king-size bed. Take advantage of the full kitchen with electric range, double sink, refrigerator, microwave, dishwasher and breakfast nook. Aside from outdoor hot tub relaxing in outdoor chairs and table on the secluded covered rear porch as you enjoy the peaceful sounds of nature and gaze into the surrounding woods. Blueberry is located within walking distance (1/2 block) to the seasonal resort pool in the Mountain Shadows resort just minutes from downtown Gatlinburg and the Arts and Crafts community. Blueberry is within 2 miles to grocery store, liquor store, and a number of restaurants. Also, Blueberry is within 2 miles in the other direction to the new Smoky Mtn World Sports Facility. Blueberry Hill was purchased early 2014 by local owners. Blueberry is close to everything, easy to get to in all weather, and yet far enough away to afford you all of the comfort and privacy you would want. This is a great little property that our guests have all absolutely adored. Cozy, Comfy, Out of the way, yet close to all. Quaint, Relaxing, Trouble-Free, Adorable are all the words used by our guests to describe this property. Full size bathroom with shower, tub. We are a short 10 minutes from downtown Gatlinburg. Mountain Shadow Resort is a small cabin community with swimming pools and pavillions for picnics and other gatherings. Cell phone reception is very good in this area. Soft sheets and comforter provided for bed..
Soft, towels provided for guests stay. Additional towels are provided upon request. Small couch, chair, and television with DVD player and cable service. Comfy table for two with coffee bar and additional storage for goods. Front porch has sitting area; Rear deck with hot tub, gas grill and seating for just relaxing. Less than 10 minutes to Ober Gatlinburg. There are a number of public golf courses in the Gatlinburg area. Please check internet for location and information. Enjoy the community pool -- less than 1/2 block away. 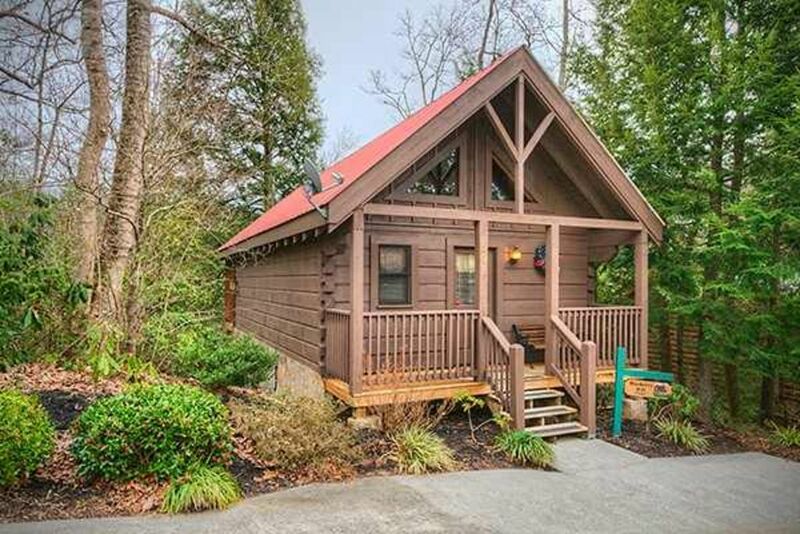 Great location away from the busyness of downtown Gatlinburg, but close enough when you want to make it. We spent most of the time in the park hiking but had access to groceries and restaurants when needed. The hot tub was a great option after a couple of our really long hikes. Can't think of anything that this location doesn't provide in the cabin. Quiet location did not hear anything from others who were staying nearby. My wife, soon to be baby Cohen and I enjoyed our stay. It was very relaxing and cozy. Extremely close to town but you still get the mountain feel. We would definitely recommend it to anyone. A beautiful little place in a great location. A lot of amazing memories made, and the deck is wonderful! Really impressed with the attention to detail that made us feel so welcome. Thanks for sharing the property with us. This was our first time in Galinburg and our first time renting a cabin and it was the best experience ever. The cabin was absolutely perfect everything was clean and the amenities were fantastic. We already can’t wait to rent this little gem again for our next getaway. We loved the romantic feel of the cabin and enjoyed the outdoor hot tub. We loved the Blueberry Hill cabin and it was absolutely perfect! We will definitely stay here again! So clean, decorated nicely and has everything you need! Blueberry Hill is located just 2 miles from the new Rocky Top Sports Center and a short (10 min) drive to downtown Gatlinburg. Grocery store, liquor store and restaurants located less than 2 miles from cabin. No reservation is confirmed until deposit is received. This cabin does not accommodate stays longer than 14 days.